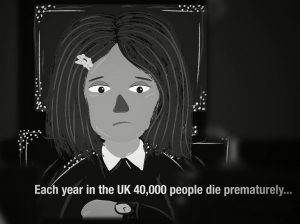 This animation has been produced by Manchester Friends of the Earth and designer Hannah Langfield. The script is below, together with links to further information. 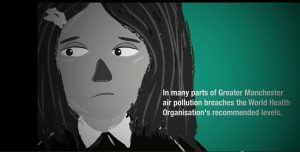 Find out more about air pollution and the campaign for clean and healthy air. 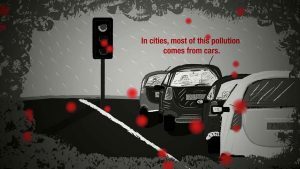 In cities, most of this pollution comes from cars. And 6 million sick days are taken due to poor air quality. The pollution affects lung function, making breathing difficult and in the young can affect brain development and school performance. Cycling or walking to get from A to B can add a relaxing moment to the day, reducing stress and allowing conversation to flow. Reducing exposure to air pollution and introducing exercise into the day will improve academic performance as children arrive brighter and more alert for their first morning class. In many parts of Greater Manchester air pollution breaches the World Health Organisation’s recommended levels. With cars on congested roads being the biggest contributor- the way we choose to get around everyday can make a big difference. 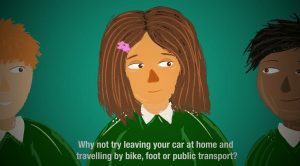 Why not start by leaving your car at home and try walking, cycling or using public transport?